I wrote this after viewing the very last showing of The Force Awakens (TFA) in my area and re-wrote it now for everyone who recently received it on home video. This is because, of all of TFA‘s similarities with the Original Trilogy (or OT, particularly with Episode IV: A New Hope), the most important resemblance to the old movies is the fact that it needs to be watched and rewatched and gets better each time. (Conversely, TFA‘s greatest difference from ANH is that it is not a self-contained story.) It’s a film that at first appears blatant and too easy to understand, but is full of subtlety and nuances that can be missed the first, second, or subsequent viewings. 1. TFA is deliberately like the Original Trilogy not just to “feel like Star Wars” but, in-universe, to show the influence of history on the characters. 2. The characters’ struggle with history is a large part of their development. 3. Things tend to end badly for characters who don’t learn from, or at least form a positive relationship with, their history. 4. The Force might have something to do with it. 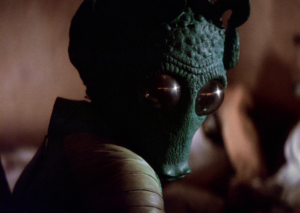 The better known resemblances to the OT are of course the various story beats, character types, and plot devices: important information being hidden in a droid, the young hero on a desert planet, the masked villain, the cantina, the space superweapon, etc. Many of the direct callbacks are also easy to notice: the iconic Star Destroyers and X-wings, the Millennium Falcon’s dejarik (chess) board, “I have a bad feeling about this,” etc. Some are easier to miss, such as the stormtrooper small talk about the new T-17s during the “sneaking around on Starkiller” scene, or the quick shot of Finn finding the lightsaber training remote droid. Even more subtle is the fact that these similarities are a reminder of the the constant presence of history and how it affects the characters today. They are merely the backbone of the film, there to enhance and showcase the true star of the movie, the characters, because TFA is a character-driven film. Indeed it is the characters who show us (in at least one case with full self-awareness) how superficial these resemblances can be. To start with a minor character: Poe Dameron seems to be friends with his astromech, flies X-wings, and uses them to destroy the superweapon like Luke did; hides important plot information in said astromech – and (more or less) resists torture over it – while mouthing off to the villains like Leia did; and is a wisecracking pilot like Han. He gives me the impression that he has looked to the first three as role models yet grew into his own person. His quickness to form warm friendships is seen in his immediate support of and enthusiastic partnership with Finn, a defecting stormtrooper. I like to think that this influence has gone full circle back to his role models, as shown in Leia’s own quick acceptance of Finn when Poe introduces them. It’s not surprising to me that Poe is the one to destroy, almost effortlessly, one of the greatest examples of not learning from history (Starkiller Base). I hope that Poe will continue to be instrumental in bringing about about positive change in future episodes. Poe’s ability to facilitate positive change was nicely shown in his relationship with Finn. Change does not happen in a vacuum. When Finn’s realization of right from wrong (or empathy, or perhaps the Force awakening him) did not allow him to continue obeying the First Order; he needed help escaping. This would not have happened if Poe was unable to see First Order soldiers as individuals instead of the evil monolithic entity they often seemed to be in the Original Trilogy. While I wondered at first if he simply saw Finn as a means to an escape, the friendly dialogue between the two (culminating in Poe helping Finn form his own identity) combined with the actors’ amazing chemistry helped show that the enthusiasm was genuine. I think the brief friendship with Poe was enough to keep Finn open to further connections and eventually joining the Resistance and I look forward to seeing it continue. Kylo Ren and Rey (who are difficult to write about separately so for this section I won’t even try) seem to be based closely on Darth Vader and Luke Skywalker, respectively. In fact, Kylo* knows exactly what he is doing when he puts on a mask with a voice modulator, wears black robes, uses a red lightsaber, and immerses himself in the Dark Side. But inside he bears little resemblance to the cold, calculating villain (who had maybe ten minutes of screentime) of A New Hope. Vader was not trying to imitate some hero he idolized, nor did he struggle with his feelings, his good side, his self-image, or his temper. Vader was confident in his power and who he was, and this wasn’t shaken until much later in the trilogy. Kylo, as Han pointed out, did not even need his mask the way Vader did; he just wore it for show. His crudely built, unstable lightsaber, which he uses for destruction and making threats, is clearly meant to reflect Kylo’s own emotional instability. Kylo knew his posturing wasn’t fooling everyone, and although familiar with Vader’s history he disagreed with Vader’s turn back to the good side and hoped that proving his rejection of his love for his family by committing an unforgivable atrocity would finally bring him fully to the Dark Side and become as powerful as Vader at his prime. Rey does not seem to deliberately try to be like Luke, but like Kylo she has reverence for the past and collects memorabilia as though she were a Star Wars fan (though in her case it’s largely by necessity and occasionally for her own entertainment as well as personal identity). She lives on a desert planet in a broken AT-AT, scavenges Star Destroyers, dresses in wrap clothing very much like Luke’s, is a good pilot, made herself an X-wing pilot doll, and enjoys wearing a pilot’s helmet for fun even though she might have sold it for necessary rations. Also like Luke, she is a compassionate person who sees droids as people and feels loyalty to her family despite their questionable treatment of her. Even our first introduction to Rey’s face, when she removes her mouth cover and goggles, reminds me of the time Luke did the same in the beginning of Empire Strikes Back. She knows the stories about both Luke and Han and appears to admire them. Yet she is very different from Luke, both as a character and her role in the movie. Luke wanted to leave Tatooine even though his family was there; Rey is determined to remain on Jakku in order to reunite with her family. Luke had a relatively safe and secure life with family and friends; Rey was alone except for an apparent former guardian who exploited her with low compensation for her work. Rey also was more independent and often had to fall back on her own skills and problem-solving for the entire movie, while Luke spent a large part of A New Hope being awkwardly along for the ride and having difficulty correcting his mistakes. Luke’s and Rey’s stories did, however, meet in the end when they finally trust in the Force to help them overcome a great obstacle and save their friends. Just as Kylo and Rey are mirrors and subversions of their OT counterparts, so they are excellent foils for each other. Kylo rejects his father, while Rey longs for one. Rey at first does not want Anakin’s lightsaber or to explore her strength in the Force, while Kylo searches hard for both. While the film visually connects Finn and Rey with a closeup of Finn replacing his helmet cutting to a closeup of Rey in her head covering and stormtrooper goggles, I think Rey and Kylo are especially connected in their respective facial introductions. We first see Rey’s face when she removes our mask for us, but she is alone. We first see Kylo’s face when he removes his mask, but he is not alone; it’s for Rey he removes it (I will explore that in a later part). But I think the most important comparison between the two lies in their mixed feelings about their families and, relatedly, their shared reverence for the past that I mentioned, which they possessed to a fault. Kylo idolizes Vader and visits his melted helmet, praying to its former owner for guidance. Rey idolizes the owner of the old Rebel pilot helmet (the owner of which Rey was drawn to partly because, according to the book Rey’s Survival Guide, she was called Captain Raeh) and honed her pilot skills to be more like her hero. Because they both desire belonging and personal connections, they are so obsessed with their own history that they can’t let go of it. Kylo, for whatever reason, became estranged from his current family and apparently finds a role model in Vader, but he completely failed to learn from Vader’s example. While it’s not clear which thing it is Vader started that Kylo wants to finish, Vader did turn to the Dark Side in order to gain power and protect the people he wanted to protect. But turning instead made Vader a slave to Palpatine and lose everything else. Kylo’s attempt to turn weakened him and did not help him defeat Rey and gain his grandfather’s lightsaber, or bring closure to his unhappiness with his father. What it did do was gain the approval of Snoke, the Palpatine-like figure who only wants Kylo for his power. Kylo may well repeat Vader’s history to his own detriment if he doesn’t learn from it. Rey, meanwhile, could have left loneliness and poverty on Jakku behind at any time once she learned how to fly ships. She understandably followed the wisdom of remaining where she was left so that she can be found again, however, she had been left there a very long time. If Rey didn’t change her situation herself she may well have ended up waiting forever, made explicit when she notices the elderly salvager, but for a time seems to accept this possibility. Just as Kylo struggles with two opposing facets of his nature — his light side and love for his parents against his anger and disappointment with them and whatever he admires in Vader — Rey struggles with her need for a family, causing her to remain on Jakku and passively accept Unkar Plutt’s meager wages, against her strong-willed nature and the better option of going out and looking for her parents herself. Before facing his father, Kylo deals with his lack of power by expressing negative qualities, lashing out through temper tantrums. 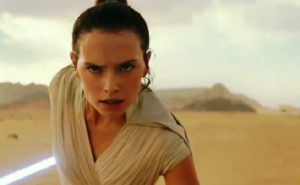 Rey deals with hers by expressing compassion and strong will: freeing BB-8, letting him stay the night, knocking Finn down when she thinks he stole BB-8’s master’s jacket. The side that Kylo chose shows that he failed to learn from his family history — the Dark Side is not stronger — and lose the fight. When faced with the choice to move forward from history as explained by Maz, Rey literally ran away from it but was easily subdued and captured for her trouble. It’s later, after she learns that Finn came back for her that she realizes that Finn is part of her family now and she is able to let go of her obsession with the past. In making her Light Side choice by accepting the positive aspects of her nature and deciding to defend this new family — letting the Force in — the lightsaber flew to her hand instead of Kylo’s and thus the knowledge required to find Luke came into her possession instead of Kylo’s. To be clear, I don’t think Rey or Kylo needed to forget the past or stop caring about whichever family members they were attached to. I can understand Kylo believing Vader was strong and wanting to be more like him, and Rey wanting her own family back. What they did need to do was learn from and come to terms with what happened and move on, and Rey was successful enough in this. If she isn’t a Skywalker then it can still be a positive step for her to go out and look for her family now that she has stopped waiting for them to come and save her. But the individual development of Rey, Kylo, and others will be the subject of later parts of my review. As a side note, it makes sense that the First Order and Kylo became allied. Their interests intersect to some extent. The First Order, best exemplified by General Hux, idolizes and attempts to imitate the Empire just as Kylo does with Vader, to the point of even copying the Empire’s repeated usage of giant space superweapons in the hopes that this time it would finally lead to the desired outcome. As with Kylo, this failure to learn from history, to stop romanticizing a past they didn’t live in, and to let go of bitterness over the defeat of Imperial parents or grandparents, leads to yet another defeat. While I don’t think Han had this in mind, I’m not surprised that he believes Captain Phasma, as one of the top officers of the First Order and someone who also seems not to have learned from the Empire’s history, gets to be thrown right into back into Original Trilogy Empire’s callback, the trash compactor. 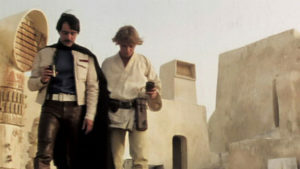 Luke has no more than two minutes of screentime, but characters’ overarching question throughout the movie of “where is Luke?” connects it to the Original Trilogy. But I think a more precise question is, why has he disappeared? Han says Luke blamed himself for the failure of his new Jedi academy and the turning of Kylo. But what exactly is Luke doing about it? Did he disappear because he no longer thinks he can do anything right so he might as well leave everyone alone? Is he just ashamed? Han also mentioned the search for the first Jedi temple, and this gives me a new idea. Continuing the thread of the characters’ sense of history, I wonder just how much he knows about the Jedi and how he went about attempting to train them. He has personally met only Prequel-era Jedi and I’m not sure he knows anything about earlier period, or non-Coruscant ones. 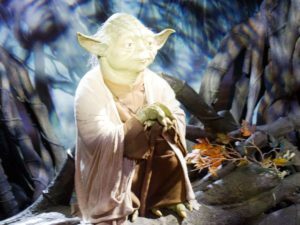 Darth Vader was also taught by Yoda and Obi-Wan, and while Luke was able to stick with the Light Side, Luke’s own apprentice was not. I think Luke is afraid that he unknowingly made similar mistakes as his own teachers and so is looking for guidance elsewhere. I think he’d be wise to hope that if he knows the full history of the Jedi, maybe he won’t be doomed to repeat it. *I will call him Kylo to avoid confusion with the similar spelling of Rey, and because he’s apparently not the only Ren anyway. See part 2 of my review here: Rey and her family.